Dhaka, 7 April, Abnews: The daughter-in-law of BNP Chairperson Khaleda Zia and wife of late Arafat Rahman Koko was not allowed to meet ailing mother-in- law on Saturday. Sharmila Rahman Shithi, daughter-in-law of the BNP Chairperson went to BSMMU after Khaleda Zia was taken to the BSMMU from the jail at 11.30am for medical check-up. Police restricted Shithi when she along with her two daughters tried to enter the cabin block, reports UNB. Then she waited at the hospital premises in their car for some time while the leaders and activists of Jatiyatabadi Mahila Dal surrounded her and chanted anti-government slogans. Police arrested 4 to 5 people among the sloganeers while Shithi went to the room of hospital director. Police also barred Afroza Abbas, president of Mahila Dal and wife of BNP standing committee member Mirza Abbas from visiting Khaleda. However, Khaleda’s two lawyers -- Sanaullah Miah and Barrister Mahbub Uddin Khokon -- met Khaleda at the hospital while the BNP chief’s personal physician, Mamun, was also present. 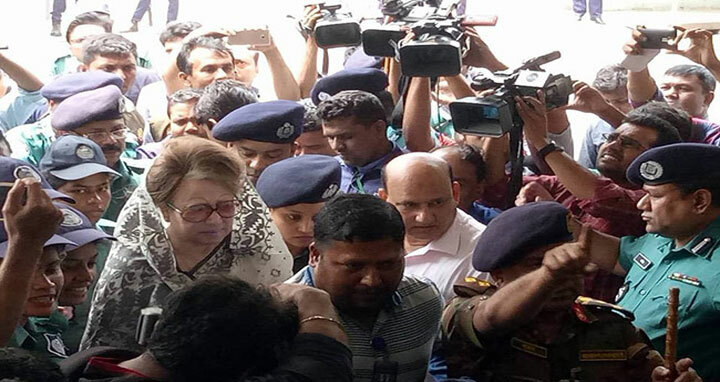 Earlier, ailing BNP chairperson Khaleda Zia was taken back to Dhaka central jail from Bangabandhu Sheikh Mujib Medical University (BSMMU) on Saturday after medical check-up and tests.